"I believe our natural state is to be happy and content but sadly this often gets buried by emotional and psychological baggage which can leave us feeling confused, anxious, angry, depressed, stressed and unfulfilled. I specialise in freeing people from their self limiting and destructive emotional 'baggage' so that they can awaken to their true nature of happiness and contentment. If you're ready to lose your baggage, please get in touch!" I offer two distinct ways of working together which could be thought of as either active or passive. For those wanting 'active' participation in creating profoundly positive changes in their lives, I offer a comprehensive Coaching Programme and for those seeking a more 'passive' approach, I offer a simple but incredibly powerful and effective form of energy healing called The Emotion Code. Both methods are highly effective and successful so you're free to choose whichever suits you best and I am confident that I can help you, whatever your situation! You are a unique individual, with a unique set of issues, circumstances, challenges and goals. Your coaching program will therefore be tailored to your specific requirements to get you from where you are now, to where you want to be. Awakening to the Present Moment. Energy healing incorporating The Emotion Code. Often, my coaching work with people starts off dealing with specific clinical issues, such as anxiety, stress or depression and evolves into an ongoing Life Coaching role, with a number of clients choosing to continue working with me for many years. Sessions are usually weekly, either in my office in Chudleigh, Devon or via Skype. Coaching requires a minimum of 4 sessions but most clients initially commit to 8 and many achieve their goals within this time, although some things may take longer. In order to gain a full understanding, I offer a completely free, no obligation Initial Consultation which lasts around 90 minutes. If you are serious about creating life long positive change, please get in touch! My hypnosis tracks have helped hundreds to enjoy greatly improved sleep, relaxation and overall wellbeing. To download my 'Sleep and Be Happy' and 'Relax and Reframe' hypnosis tracks simply add your email address and click subscribe! Everything in the Universe is made of energy and this includes our thoughts and emotions. Imagine emotions as being like a wave in the Ocean that rises and falls and your sub-conscious as being like a fishing net which these waves of negative emotions continually flow through. The wave may have passed, but we can be unaware that particles of each negative emotion have become trapped in the netting. Over time these particles build up and can even become clumped together distorting and twisting the net out of shape, creating imbalances which in turn, attract even more particles. As these trapped negative emotions build up within our bodies, they begin to influence our emotional and psychological states as we become more predisposed to experiencing whatever emotions are trapped, such as depression, anxiety or anger and they can even block us from experiencing love, happiness and financial abundance and make us feel disconnected from others. In fact it's now widely thought that trapped emotions are also the catalyst for all physical illness and disease. The Emotion Code is a simple but incredibly effective and powerful energy healing system for identifying and releasing these harmful negative trapped emotions. Sessions can be either in my office in Chudleigh, over Skype or the telephone. Watch a short video on The Emotion Code. The Emotion Code™ was developed by Dr. Bradley Nelson and in short, is the simplest, easiest, and fastest method ever devised to find emotional baggage (using muscle testing) and release it. Listen to my 60 Second Coaching Sessions! 60 Second Session Number 1. 60 Second Session Number 2. 60 Second Session Number 3. Nine out of ten clients that I work with are introduced to me by friends or family members that have already worked with me, have experienced the benefits and are happy to recommend me. If you don't have the comfort of that direct personal introduction, please take the time to read the words of a few people that I have worked with who have kindly shared their stories in the hope of inspiring people just like you to take action and create positive life changes! High flying chef now flying high…. and enjoying it! 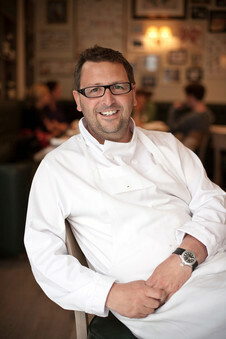 ​Mitch Tonks is an award winning chef, restaurateur and successful cookbook author on his specialist subject of Fish! As such, he has always had to travel extensively for his work, so being terrified of flying was something of an inconvenience to say the very least. “Flying used to be a nightmare for me. I dreaded business trips and even family holidays because of my fear of getting on planes. Then a couple of years ago, a friend of my wife recommended I talk to this guy called Graham McDowell. I didn’t know what to expect but after chatting with Graham for a couple of hours it was a revelation. He explained exactly what was happening in my mind and how my own thoughts were generating the fear and anxiety I was feeling. It made complete sense and straight away I felt more empowered. We crammed in a few quick sessions as three weeks later I had to fly to the states, which would usually have been horrendous, but it was absolutely fine! No booze required and I even enjoyed the trip! Below are some of the issues I can help with. If your particular concern is not listed, please just get in touch and ask!